This might also be caused by an internet filter, such as SafeEyes. If you have such a filter installed, try adding appspot.com to the list of allowed domains. As an adult, there are two possible strategies for learning Chinese characters: spaced repetition, and anything else. Seriously, the difference is dramatic: research shows that after enough characters, you'll forget more than you learn with naïve study methods. 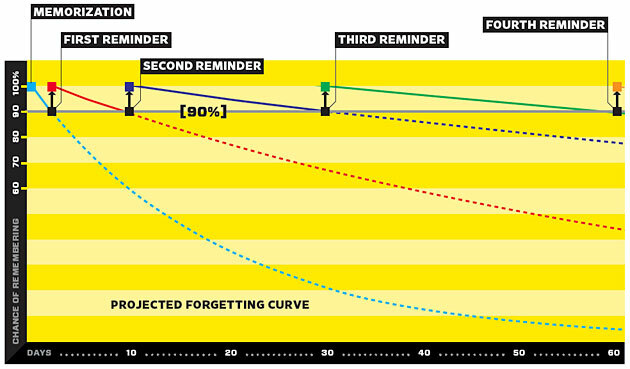 The principle behind spaced repetition is that it's a lot more effective to review something at the point when it's about to be forgotten. The longer you have known it, the less frequently you'll have to review it. Ideally, you want to review things when you have a 90% chance of remembering them (corresponding to a 90% retention rate). After several repetitions of a character, your repetitions will be months apart (and soon years apart). The problem with most spaced repetition systems is that they have no idea whether you remembered an answer unless you tell them. Many of them ask you to grade yourself on a 0-5 scale after each prompt, so that they can adjust your interval accordingly. Not only is that distracting, but it doesn't have active recall built in. Active recall is the key to long-term memory: you have to come up with the answer yourself, rather than just see the answer on the flip-side of the card. Existing programs are spaced repetition for flashcards, not characters. That's why we made Skritter. Even if something about Skritter doesn't do it for you, we still recommend that you use spaced repetition of some kind, whether it be a simple Leitner System with paper flashcards, or electronic flashcards as seen in the open-source Anki or Mnemosyne. A lot of the research on spaced repetition originally came from the creator of SuperMemo, which still has the most information about spaced repetition and potentially the most complicated scheduling algorithm. However, because SuperMemo has such a complicated UI, we'd recommend Anki or Mnemosyne over it. There's also Mike Love's PlecoDict, if you want in-depth control of your flashcards and have an iOS or Android device. If you're curious about the specifics of Skritter's scheduling algorithms, we have lots of details written up.